Groin and inner-thigh pain in runners can arise from a number of factors, but usually result from overuse. The condition affects sprinters and marathoners alike, and often persists unless properly identified and subsequently treated. Understanding the signs of groin and inner-thigh pain can better equip you to recover faster and run sooner. Inner-thigh pain, often referred to as a groin pull, generally occurs on the upper inner thigh muscle. Also known as the iliotibial band, this muscle is primarily responsible for turning the toes during running, producing a balanced stride. Pain results when the upper inner thigh muscle over-tenses. Overuse is the chief culprit behind groin-pull injuries, though other causes can lead to injury. Insufficient pre- and post-run stretching can leave the upper inner thigh muscle vulnerable to over-tensing, as can running on a slippery surface. Additionally, over-pronation and supination -- inward and outward rolling of the foot, respectively -- can create a foot imbalance, which further stresses the muscle to keep running balance. 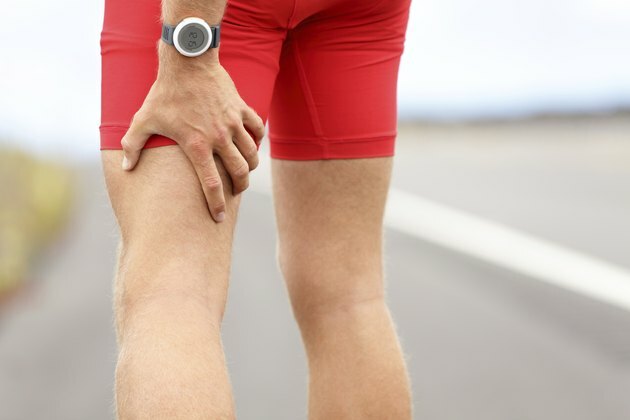 Though it's not what most runners want to hear, staying off the roads or treadmill for several days is the best weapon for treating inner thigh pain. For severe groin pulls, a runner should rest for at least a week to allow the muscle to recover fully. Minor pain should still prompt rest, though shorter, slower runs sometimes are feasible. After the upper inner thigh muscle is sufficiently rested, a number of focused stretches can build muscle strength. The groin stretch is accomplished by sitting on the ground with feet together and back straight and gently pushing down on your knees with your elbows. The inside leg raise is also helpful: Lie on the side without pain, tighten the muscle of your affected leg, and slowly lift it up. Hold for a couple of seconds, then slowly return it to your bottom leg. Stretches should be done gently and repeated a few times a day to maximize their benefits. In addition to rest and stretching, inserting a specialized wedge into each running shoe can help injured runners prevent pain in the future. A wedge is particularly beneficial to a runner with limited ankle rotation and should be placed on the inside of each heel. This enables the ankles and heels to turn with less stress on the upper inner thigh muscle.